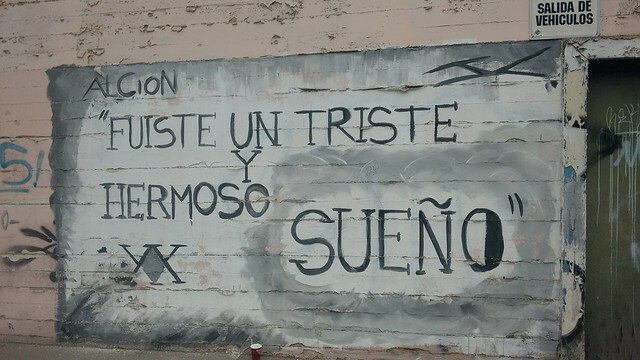 I might as well get it out there: I loved, loved, loved Iquique. 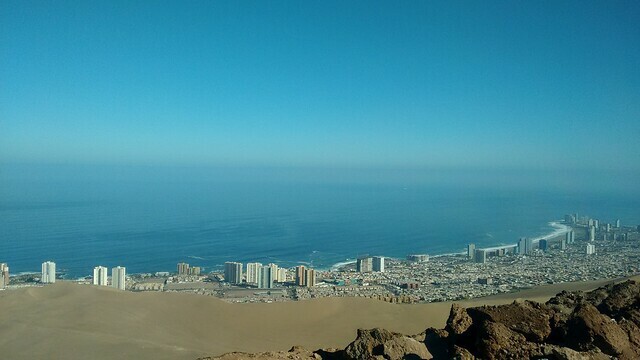 Iquique is a uniquely situated city; it rests steps away from the ocean, yet is also only a short climb down the sand dunes from the inland desert, home to the saltpeter mines which boosted Chile’s economy for a century. 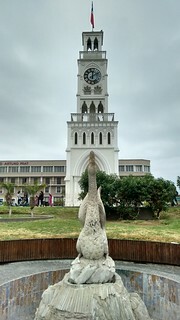 Once the site of many a territorial dispute and their ensuing battles, Iquique is currently only a few hours away from both the Peruvian and Bolivian borders, meaning it has many immigrants and much cultural influence from its neighbors. On top of that, it is an active port city which has become famous in recent years for its surfing and paragliding, increasing its popularity among tourists who come for its great weather and traditional architecture reflecting the British influence from the mining heyday. Iquique has been on my radar since 2013, when I spent a few days appreciating Arica. Instead of exploring along the Chilean coast, I headed inland to the Atacama desert to realize one of my travel dreams of finally seeing the landscapes around San Pedro de Atacama. I figured I could head to Iquique on my way back through Chile later in my trip, but I ended up skipping it. However, after suffering through the chilly desert nights in the Valle de Elqui, I was more than ready for some warm beach temperatures during my winter vacation in July. After saying goodbye to Sara, my partner-in-crime for adventures in Santiago, Viña del Mar, and Isla Negra, I headed north to Caldera, where I spent a weekend before moving on to my final destination, Iquique. After an arduous bus ride through the inland desert, I finally arrived in Iquique. Since it was late afternoon, I headed directly to my hostel, Hostel El Bajo, located just a block from the ocean. A family-run hostel popular with surfers, I felt like I was part of the group immediately upon arrival and decided to stay for the rest of my vacation, giving me time to fully explore the city as well as the sights of Tarapacá: Oficina Salitrera Humberstone, the oasis of Pica, the healing thermal baths of Mamiña, and Parque Nacional Isluga. 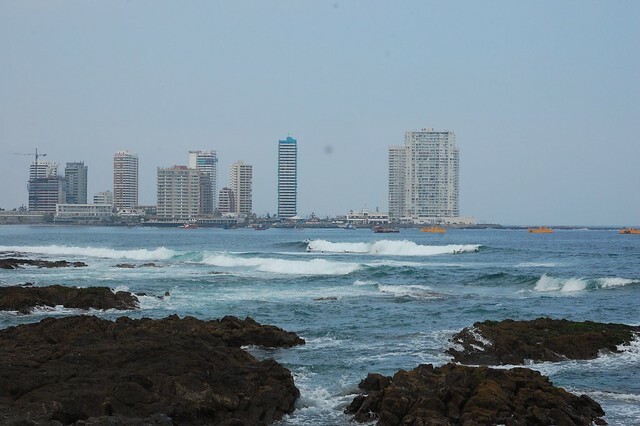 I spent most of my time in Iquique wandering the streets and along the coast, taking in the city’s ambiance and thinking about moving here after I finish my year in the Valle de Elqui. 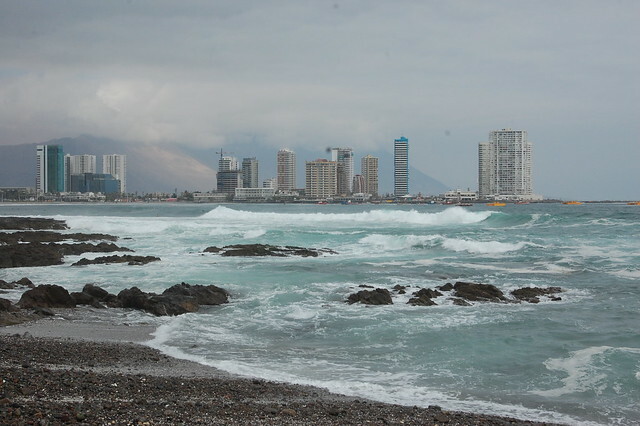 Here are some of the places I think are worth checking out in Iquique. Baquedano is the main pedestrian thoroughfare in downtown Iquique precisely because it is exclusively for foot and bicycle traffic. Restaurants, hostales, and tourist agencies dot the cobblestone roads and wooden sidewalks, many of them brightly painted in colors that show off their attractive wooden balconies. Sadly other buildings are falling apart from neglect or leftover damage from the 2014 earthquake. Since I was staying by the beach, I chose to walk along Baquedano to the commercial center of town, the Plaza de Armas. In the middle of the Plaza de Armas stands the Torre de Reloj, or clock tower, one of the distinctive features of the main square. 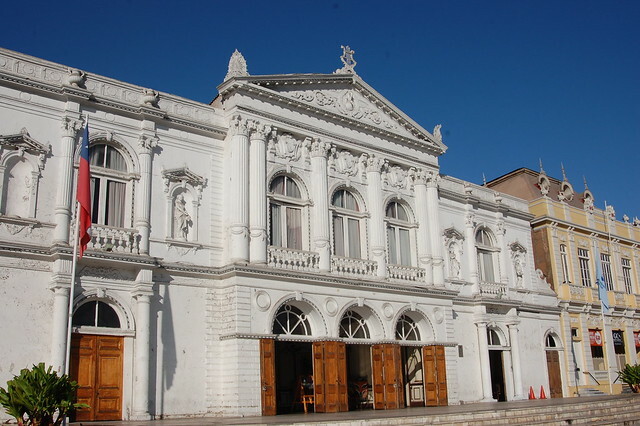 Just next to the Plaza de Armas is the Teatro Municipal, a bright white building reflecting the grandeur of Iquique’s lucrative past. Due to its popularity among tourists, there are many cafés and restauarants all around this part of Baquedano and the surrounding side streets, providing a nice place to relax and people watch. 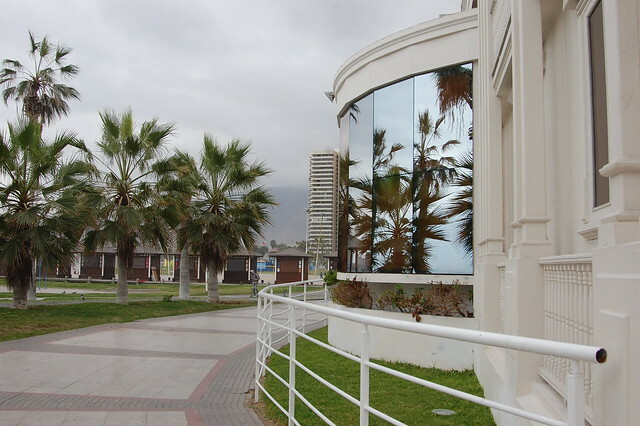 Iquique has a large number of Croatian immigrants, who even have a cultural club right on the main plaza. 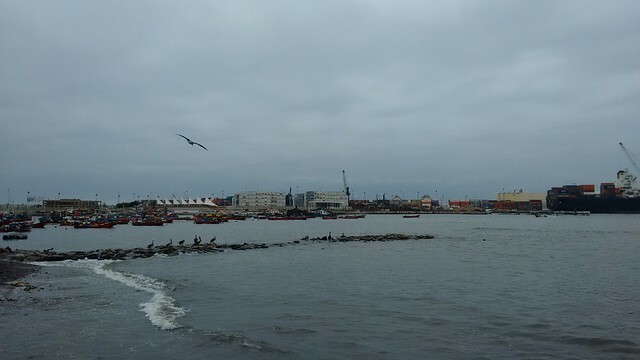 This part of Iquique is particularly busy with business, as there are banks lining the nearby streets, as well as the municipal buildings and other tourist services. Chances are, if you need it, you can find it near here! The colorful buildings are especially pleasant to look at on a sunny day, but unfortunately there was not that much sun during my visit. Even still, I admired the well-preserved wooden balconies and construction throughout the downtown area. 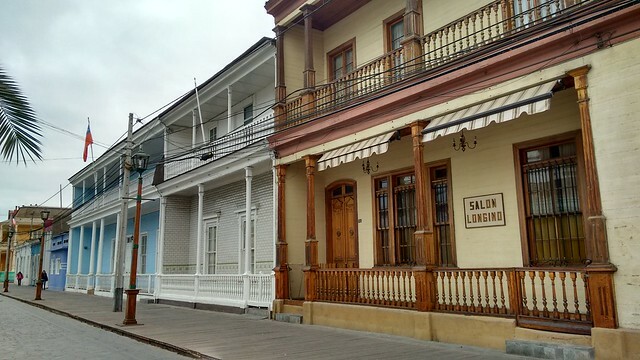 Just a couple of blocks from Baquedano is this traditional neighborhood, boasting wooden construction which still looks pretty awesome after all these years. Near the busy bus terminal lies one of Iquique’s most popular museums, a reconstruction of the famous ship called Esmeralda. This ship was sunk by the Peruvian navy during the Battle of Iquique and as such serves as a national symbol of Chile’s military pride. 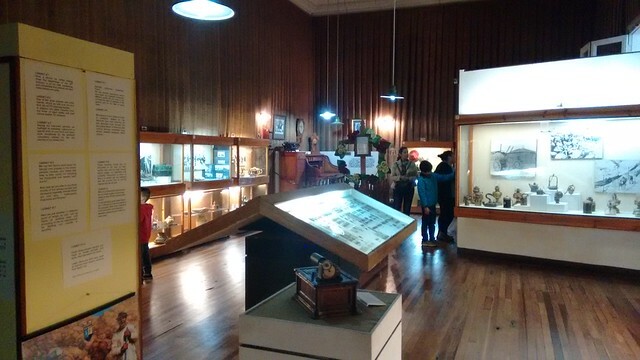 The museum was packed with visitors as it was during winter vacation, and it is generally best to reserve a time slot in order to tour the ship. Although I was curious, I was more interested in exploring the rest of the city so I decided not to wait in the long line. Behind the Museo Esmeralda and the bus terminal, you can check out the commercial port, albeit from a distance. 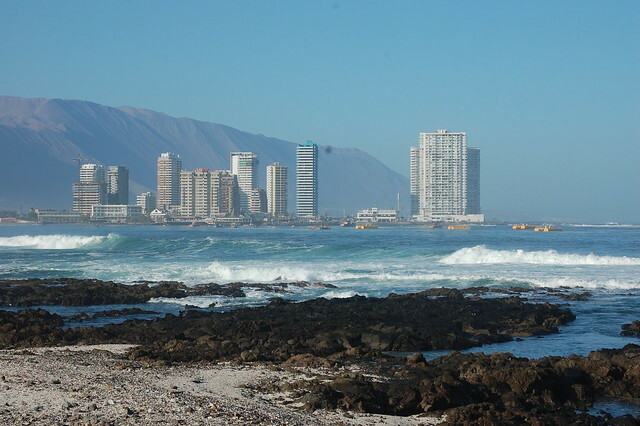 It gives you a sense of the massive amount of commerce that passes through Iquique and has made it such an important city in the Chilean economy. 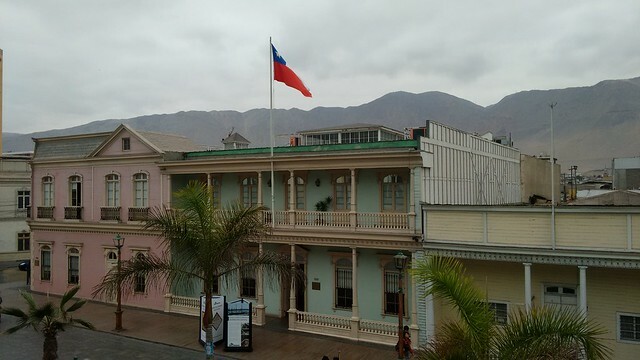 After wandering around downtown a bit, my curiosity in the history of Iquique was definitely piqued, so I headed to the Museo Regional de Iquique, located on Baquedano. 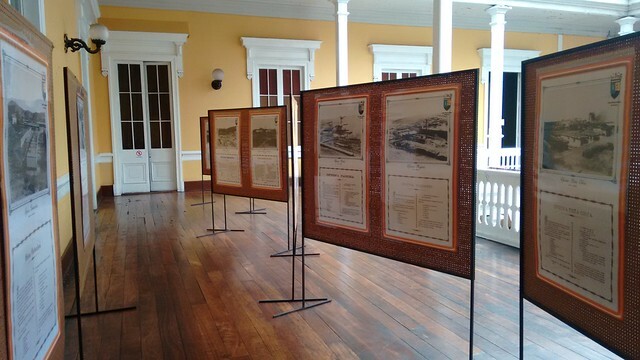 The museum is completely free and has permanent exhibits on the indigenous populations that resided or still live around Tarapacá and on the saltpeter mining industry which dominated the nearby desert for over a century. At the time of my visit, the museum also had an interesting photography exhibit and video presentation representing the Fiesta de La Tirana, a major cultural and religious event that had taken place in nearby La Tirana in mid-July. It is known especially for its traditional dances and costumes representing the Diablada, or the Devil’s dance. I was particularly interested in the exhibits on the salitreras, or saltpeter mines, as I was also planning on heading to Oficina Humberstone, one of the best preserved and biggest former mines. Mining is such a major industry in Chile, and the exhibit gave me insight into how the saltpeter and nitrate industry has impacted generations of families in the north. 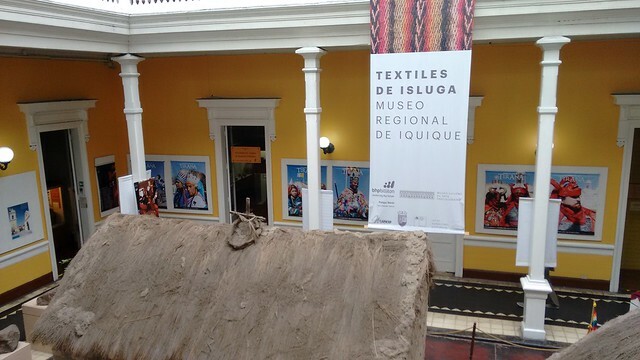 I was also excited to see the exhibit on textiles from Isluga, where the Aymara still live and weave in the traditional styles used for centuries. This was a nice preview for my visit to the altiplano, or highlands, later that week. Naturally, as I was staying just a block from the beach, I had to spend some time wandering along the malecón, enjoying the sound of the waves and the views of the coastline. Iquique’s wooden boardwalk is a pleasant place to walk, and a nice bike path runs parallel along the whole length of the coast. 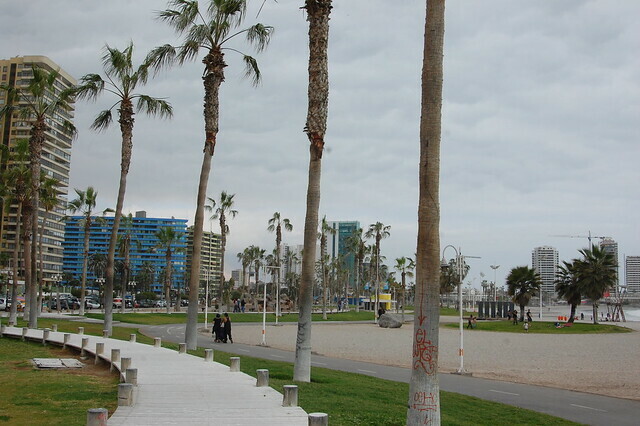 Further from Baquedano, towards the casino, the boardwalk turns more touristy, near the most popular beach, Playa Cavancha. Since I went in the off season, most everything was closed up, with the exception of some souvenir stands. All in all, I enjoyed my lengthy walk along the coastline, even though it was cloudy, windy, and chilly on this particular afternoon. I would love to return in summer and really soak in the beachy vibes. 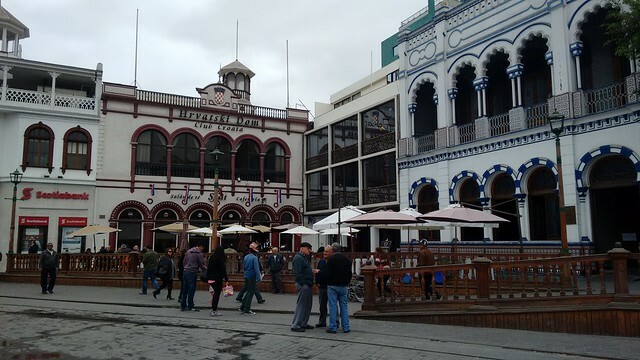 The center of all commercial activity stems from the Mercado Centenario, located in the middle of downtown Iquique. The market sells fruit, vegetables, dried goods, fish, and lots of other food options, and has a number of restaurants both in and outside the market. I couldn’t resist a fresh juice at the market, made from the varieties of fruit that grow in the area, like oranges, mangoes, and guavas. 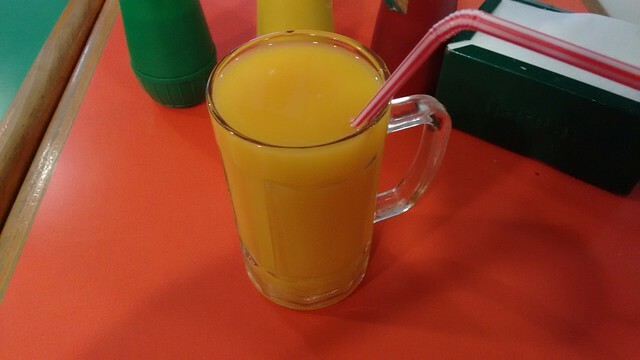 Sitting down at an outdoor café with juice in front of me reminded me a lot of the many similar markets I’ve been to in Peru! Near the market, there are several commercial streets selling just about everything you can imagine, and regional buses leave from a couple of offices just a block away. 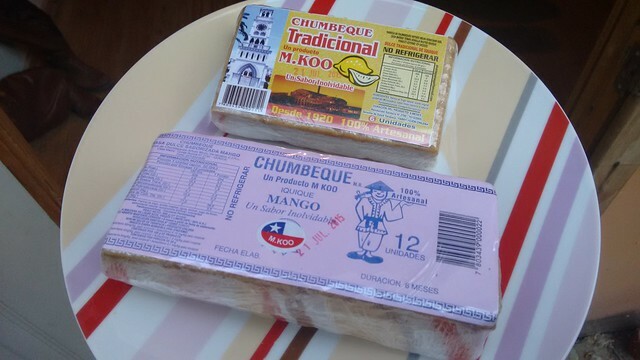 In my research about Iquique, I came across recommendations to buy chumbeques, super sweet bar cookies produced in Iquique with regional fruit. I headed straight to the factory at Ramírez 795 and tried the crumbly cookie sandwich stuffed with mango. I ended up returning to buy a pack of mango chumbeques as well as the traditional one filled with the local limón de pica. These are great snacks for a hike or long trip as they store well and provide a burst of energy. 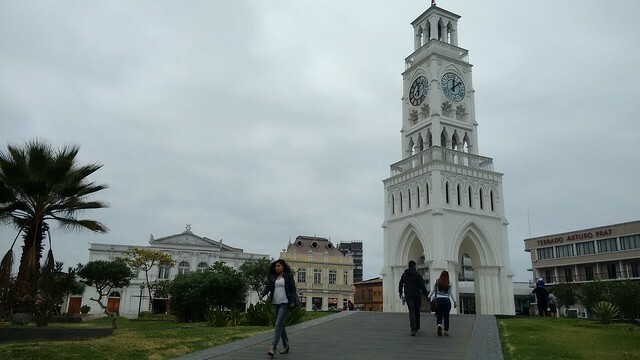 As you can see, I was charmed by Iquique, because of its beautiful coastline, interesting architecture, multi-faceted heritage, and ambiance that reminds me of my beloved Peru. 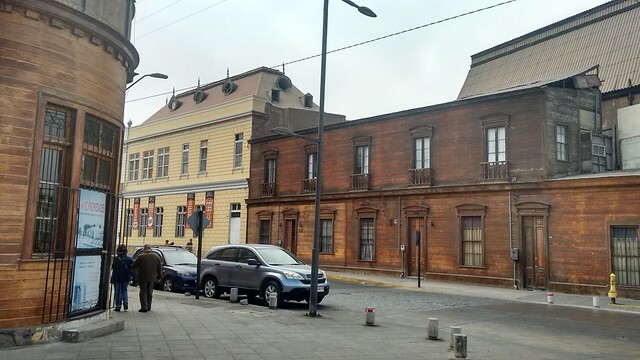 My adventures around the Tarapacá region continue to inspire me to learn more about Chile’s fascinating history. I really enjoyed my stay at Hostel El Bajo, located at Obispo Labbé 1659, just one block from the ocean. It is a family run hostel with a Marley Coffee café inside, and they are avid surfers. The beds are comfortable with high quality mattresses even if the rooms are a bit cramped, and each room has lockers to store your stuff. The kitchen is also well-stocked, which is a great way to save money. In July 2015, a bed in the dorm cost $10000, including a simple but nice breakfast. 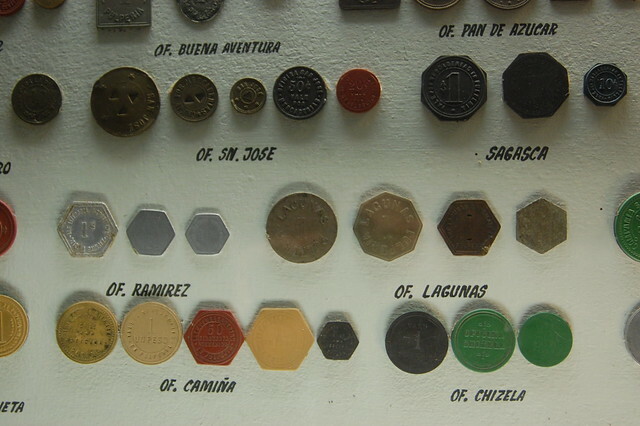 The Museo Regional de Iquique, located at Baquedano 951, has a number of exhibits which help you get a sense of the particular aspects which characterize the Tarapacá region, in particularly the saltpeter mines, the La Tirana festival, and the customs of the Aymara living in the high Andes. Entry is free. 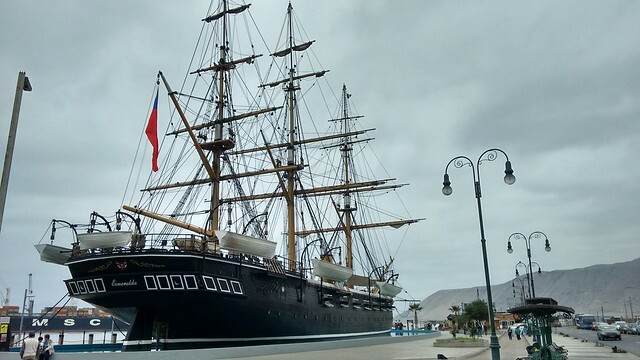 The other popular museum in Iquique is the Museo Corbeta Esmeralda, a reconstruction of the famous ship named Esmeralda. You can reserve your visit online, except on Sundays, which is first-come, first serve. The cost of admission for foreigners is $3000CLP. 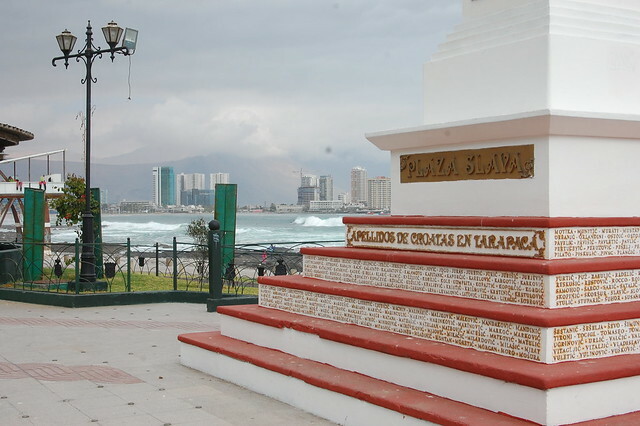 It is absolutely essential to walk along Baquedano to the Plaza de Armas to get a sense of the old Iquique and its unique architecture. Near the Plaza de Armas, there are a few side streets and markets selling souvenirs and artesanía. It is also possible to take the tourist trolley up and down Baquedano, if it’s running. 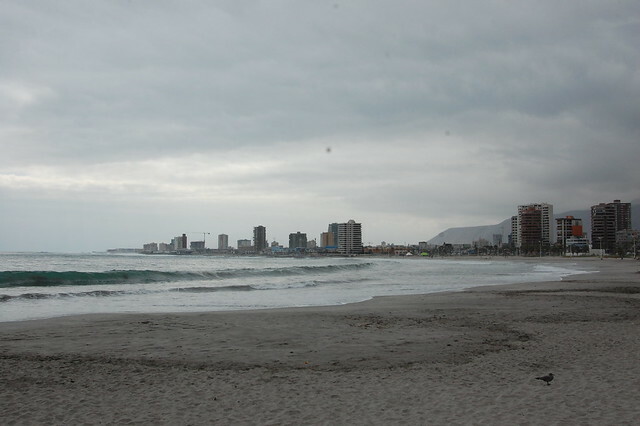 No visit to Iquique is complete without a walk along the beach. 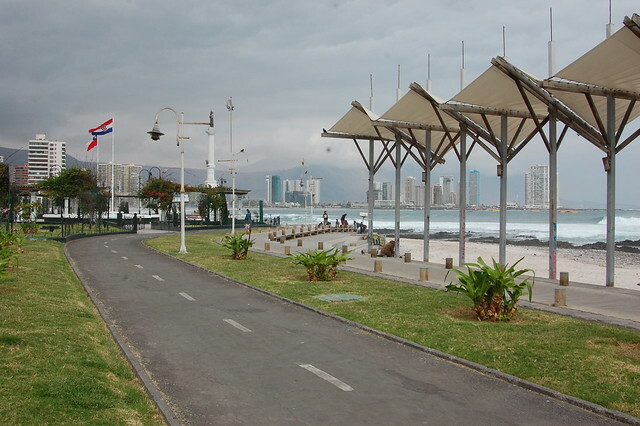 Iquique has a wooden boardwalk as well as a nice bike path that runs parallel. Playa Cavancha is the most popular beach among tourists, and closer to the casino there are other tourist attractions, although none were operational on my visit. 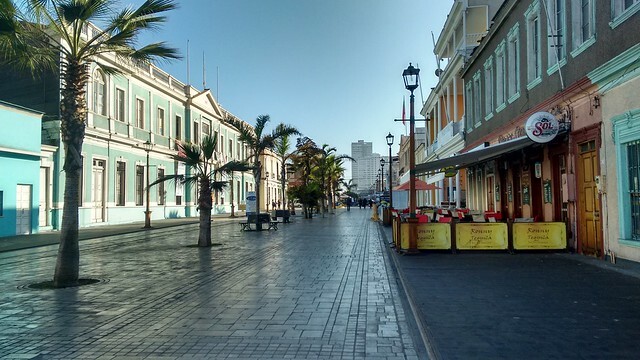 Iquique is famous for its Zofri, or tax free zone, where people buy all kinds of electronics and perfumes at low prices. I wasn’t that interested in shopping, but if you are, make sure you take a taxi or a bus there as it passes through some undesirable neighborhoods. 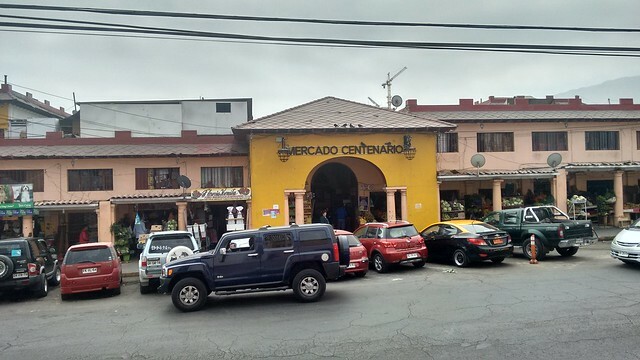 The Mercado Centenario at Barros Araña 850 is a great place to have fresh juice or inexpensive sandwiches, empanadas, or fixed price lunches. There are also stands selling fruit, vegetables, and dried goods, and you can also find a lot of products from Peru, like ají amarillo and my favorite Sublime chocolate. 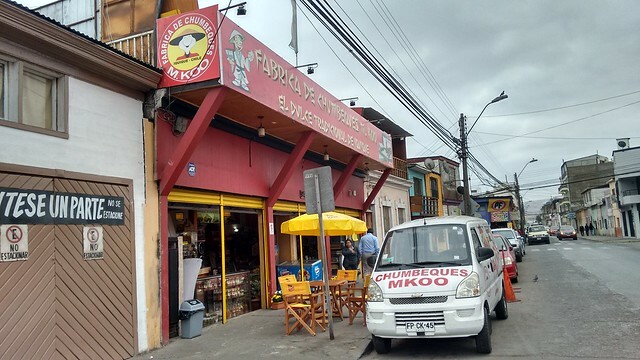 If you’re interested in trying the chumbeque, the locally popular treat that sticks to your ribs, you can buy them at the factory at Ramírez 795, or in many other spots around town. I suggest the mango flavor. Buses to Humberstone, La Tirana, Pica, Mamiña, and other local destinations leave from the 700 block of Barros Araña, just a block from the Mercado Centenario. Buses to national destinations leave from the bus terminal, near the Esmeralda and the Plaza de Armas.